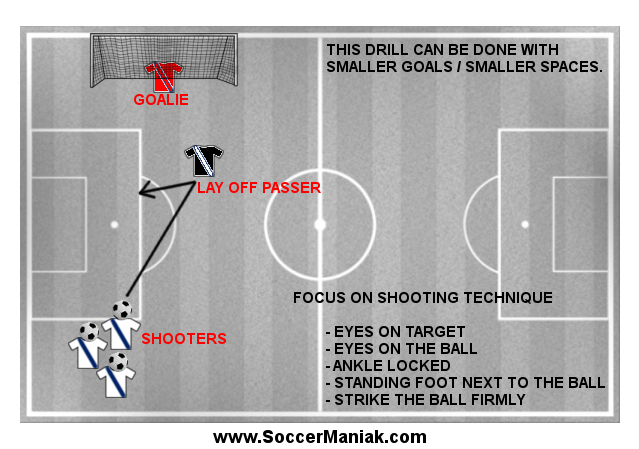 This is one of my favorite shooting soccer drills for individual soccer training, and club training set up correctly to minimize time for players waiting. This soccer drill is fun for the players of all ages, especially after they get the hang of it, and the drill starts moving faster. Players take shots on goal, with a little direction change and conditioning involved. Technique always comes before power and speed of execution. Young players need to constantly be reminded of that. Most of the time, power shots are really hard, but off target or straight at the goalkeeper. Instead, encourage players to look at the goal and aim where they want to kick the soccer ball, using the correct technique; eyes on the ball, body covering the ball, ankle locked, and striking through the ball. Any soccer skill can be improved with repetitive training, and dedication. Place 4-6 soccer balls in front of the goal, 10 - 20 m/yd away, or at a comfortable distance for the players age and skill level. Distance soccer balls 1 - 2 m/yd apart from one another. 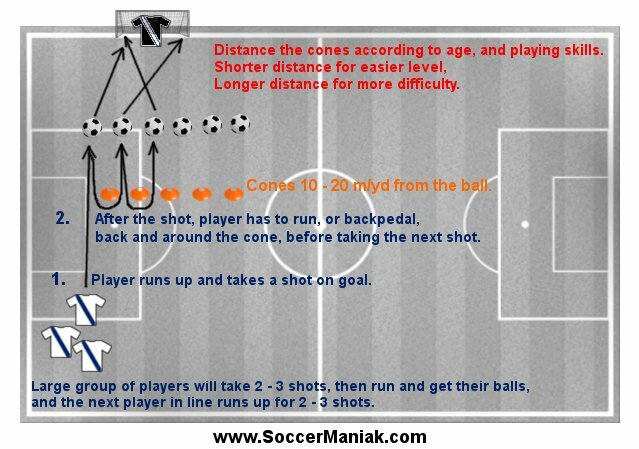 Place one cone in between every two balls, 10 - 20 m/yd behind the soccer balls. Players will line up 10 - 20 m/yd behind the cones. First player in line will run up to the first soccer ball, and take a shot on goal. After the shot, player will sprint, or backpedal, back and around the cone, than take another shot on goal. Player will keep running back and around the cone for every shot. Smaller groups of players can take all 6 shots. When there is a bigger group of players, they will want to set all the balls in their shooting range, and every player takes 2 - 3 shots, then runs to get the balls back. This makes the drill move a lot faster. Make it a competitive game by splitting players up into two teams. Each tam starts at the opposite side of the cones. Players start at the same time, trying to shoot more balls than the other team. 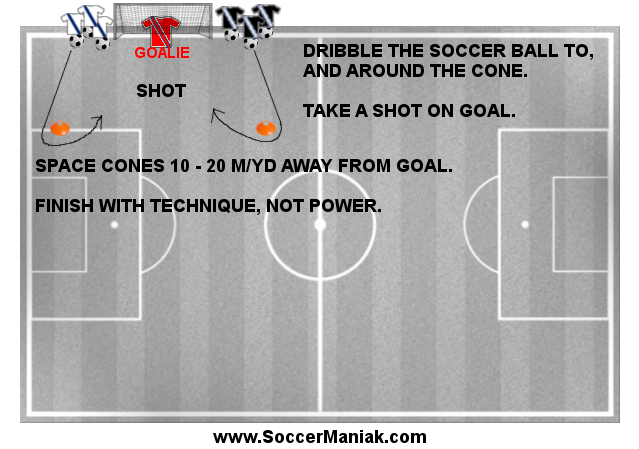 Modify this soccer shooting drill with beck pedaling after the shot, instead of normal running. Go all the way around the cones, don't cut corners. Get creative with every soccer drill. As long as the players are not waiting in line and are active on the field during training, they are improving soccer skills.